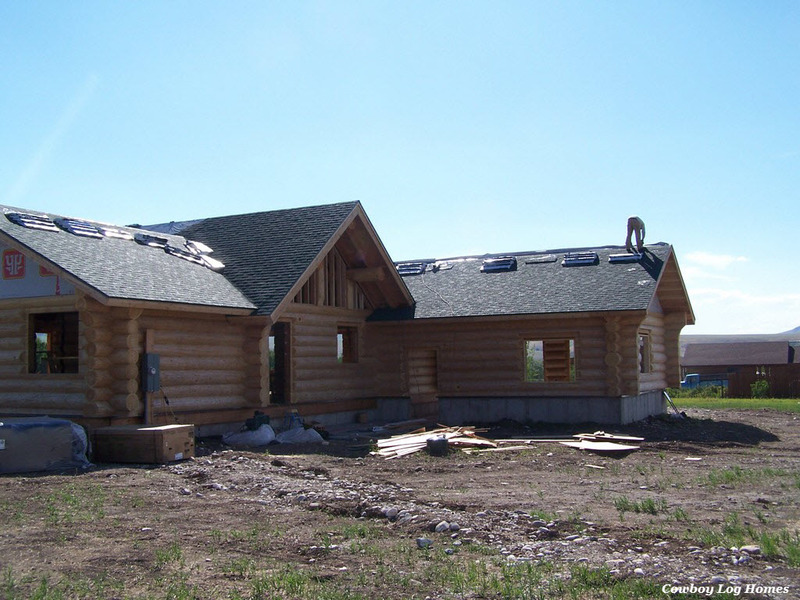 Leading into day seven of the build of our custom log home here in Bozeman, Montana we see the morning opening with the architectural singles being laid on the back part of the log cabin. This view shows the garage wing to the right, rear of the great room, and the bedroom wing. The owners chose a hunter green shade of shingle with some black flecks mixed in. 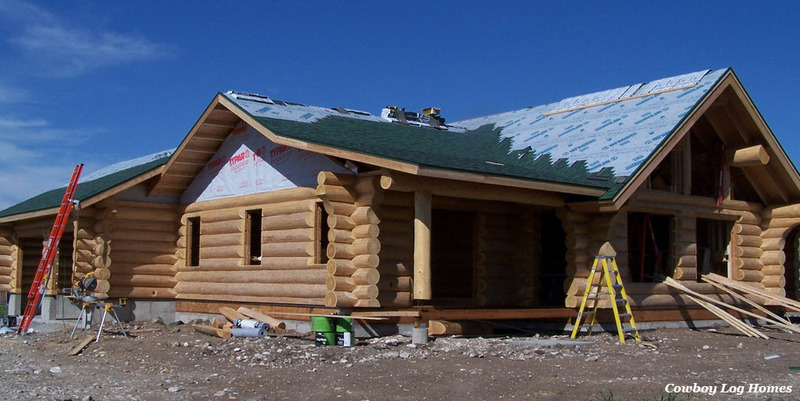 Moving around to the front of the log home we see that the shingles which were started at the end of the previous day have been completed on the bedroom wing while about half of the east side of the great room has been completed. 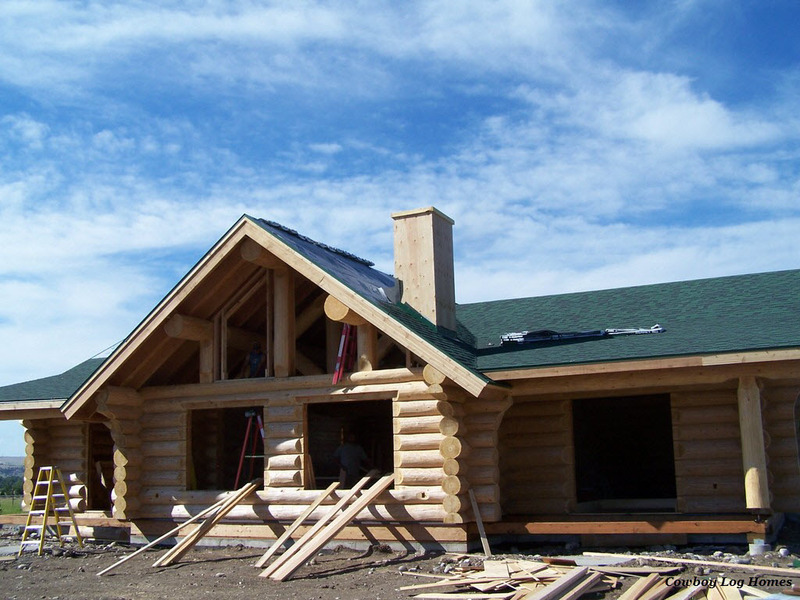 The hunter green flashing around the base of the chimney framing can be seen extending up above the shingles. Stone work will eventually come down over the top of the flashing to prevent any water penetration. But for now this is fine. This photo shows a closer look into the inside of the home. The framing for the left trapezoid window has begun. The outline of it is visible in the second triangular opening from the left side of the great room gable. The king truss is also visible through the front. Also notice how the large window openings are beveled back for the exterior window trim. This is a feature which is completed in the yard before we ship the home. 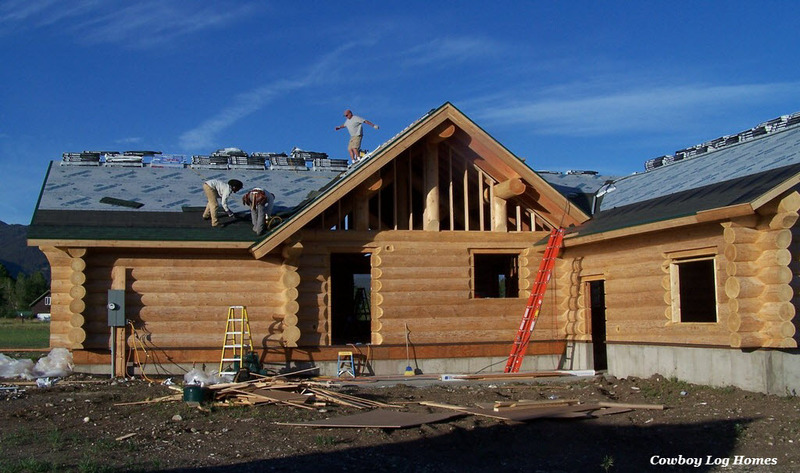 As the next angle of our custom log home comes into view we see the shingles on the left side of the great room are not as completed as the right side. The roofing on the lower bedroom wings is completed ahead of the great room. The garage is also about half way shingled. Now we have reached about 4:00 in the afternoon. The sun is getting lower in the sky we can see the shingles have progressed quickly throughout this day. The back of the garage is almost completed, the rear peak of the great room and the bedroom wing in the left side of the photo is also very far along. 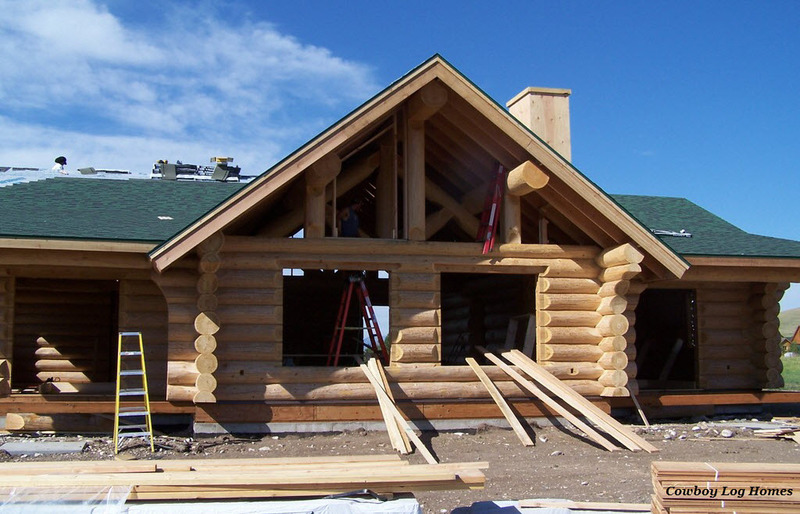 One other point of interest in this log home photo is the gable on the end of the great room. Close inspection shows that the framing between the log support posts is in progress. 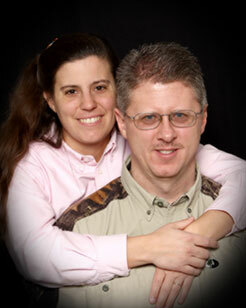 With all of the activity on the roof some of the other work can go undetected. As we move into day eight the roofing will once again be center stage.